In response to a written question, the Federal Ministry of the Interior provides more detailed information on the six scenarios to be identified for the first time. For example, the technology should classify suitcases that stand around unattended for a long time as „suspicious objects“. Persons who behave conspicuously or enter blocked areas are also be reported. The software should count people on the platform and detect when a „mass of people“ spreads quickly. Finally, the camera operators should also have the option of marking people on the video with their faces, clothing or things they have with them so that the system can follow them over a longer period of time. All functions would be available in real time, but monitoring of people and crowds should also be possible in archive material. The Federal Ministry of the Interior, the Federal Police and the Federal Criminal Police Office are participating in the project „Security Station Berlin Südkreuz“, which was launched exactly one year ago, but is managed by the railway company Deutsche Bahn AG as the host of the station. Initially, the participants had tried automated face recognition. 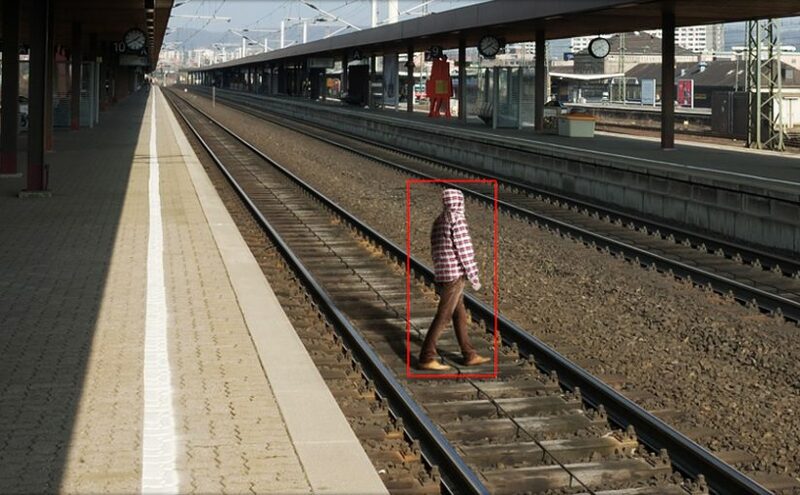 A six-month test was extended to one year to investigate the compatibility of three commercially available face recognition systems with the camera technology at Südkreuz station. The tested recognition systems were from Idemia (formerly Morpho), DELL/ Herta Security and Elbex/ AnyVision were tested. The faces were compared with a database of photos of around 300 volunteers who received shopping vouchers as a gratification. Before the tests began last summer, the Federal Ministry of the Interior was reluctant to provide information about the software used. Instead, various manufacturers were asked about the functionalities of their software and hardware. The contract is then awarded by a by private contract wihtout any tendering procedure. All systems can recognize deviant behavior, but the functionalities are very different. While the IPS software only monitors the movement of people and issues an alarm when they enter tracks, for example, other applications can also detect and track objects, count people or detect frequently occurring anomalies as „trends“. Some manufacturers also advertise that their technology is based on artificial intelligence. However, the focus should be on face recognition, which can also be integrated into most products. In the first phase of the project, Deutsche Bahn identified the monitored station areas with banners and signs. If travellers did not want to be recorded by the cameras used, they could use other entrances or escalators („non-recognition area“). Neither Deutsche Bahn AG nor the Federal Ministry of the Interior have yet explained how this is to be handled in the second phase of the project. If all camera systems in the station are accessed, it is impossible to escape the surveillance laboratory.